All CLUB EIMMIE Subscriptions are Only $19.99/month~ Join Now!! Sign up here for for fun FREE activities, fun play ideas and special offers from me, Eimmie, and all of my friends! 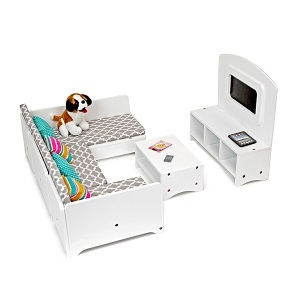 Fun Accessories: Along with a full entertainment center and built in television, this set comes with multiple doll accessories ranging from a tablet to an adorable dog! Fun And Unique Doll Accessories That Are Made To Last! The sturdy construction and glossy finish of the Eimmie bakery stand means it's built to last. Each smaller accessory to the set will withstand countless hours of playtime. One of the major concerns with doll toys is their ability to stand the test of everyday play. With our Eimmie doll toys, you won't have to worry about them breaking quickly. Each doll set is designed and constructed with high-quality doll materials. 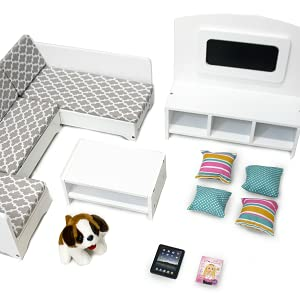 Our Eimmie doll furniture comes packed full with details to keep playtime interesting and fun! Adorable sectional style sofa with room for up to 4 dolls! Realistic accessories including remote, tablet and magazine! Bonus pet dog! The perfect addition to your cozy living room scene. Designed with childlike spirit, we've set the stage for your stories with beautiful doll accessories to help you explore the great depths of your creativity for hours of doll playtime fun. Our doll accessories add more value to playtime allowing for even more development of skills and confidence. Not only are our doll toys created for longer playtime, but they promote creativity and learning. 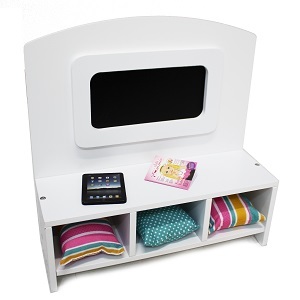 Each set is designed to guide playtime and let you expand your imagination. A subscription for a girl, her doll, and their imaginations. Sign up here for for fun FREE activities, fun play ideas and extra special offers from me, Eimmie, and all of my friends!